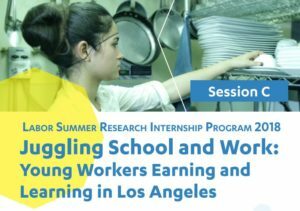 This summer the Labor Summer Research Internship Program (LSRIP), a summer program of UCLA’s Labor Studies Minor, students will engage in an applied research project to better understand the experiences of young workers 18-29 years old employed in the service sector and attending high school, community college or a 4-year university. Through this analysis, we will paint a nuanced picture of the school and work realities of young service employees in L.A. This program is an introduction to the field of labor studies and applied research in conjunction with an actual research initiative culminating in a final research paper and presentation. Our student-driven research findings will be shared with a variety of Los Angeles organizations for critical analysis and policy recommendations. For more information about this program, please visit LSRIP 2018.